Wednesday, May 1, 2019, 6:30 – 8:30 p.m. 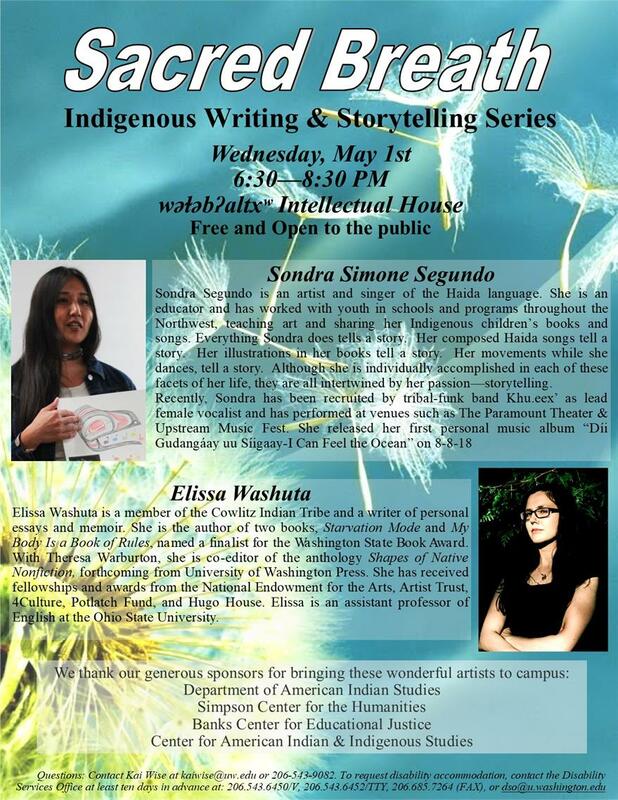 This event features writer and Sacred Breath founder, Elissa Washuta (Cowlitz) and local northwest storyteller Sondra Segundo (Haida). This is the fourth event in a series hosted by the Department of American Indian Studies. Sacred Breath features Indigenous writers and storytellers at wǝɫǝbʔaltxʷ - Intellectual House on the University of Washington Seattle campus. Storytelling offers a spiritual connection, a sharing of sacred breath. Literature, similarly, preserves human experience and ideals. Both forms are durable and transmit power that teaches us how to live. Both storytelling and reading aloud can impact audiences through the power of presence, allowing for the experience of the transfer of sacred breath as audiences are immersed in the experience of being inside stories and works of literature. Elissa Washuta is a member of the Cowlitz Indian Tribe and a writer of personal essays and memoir. She is the author of two books, Starvation Mode and My Body Is a Book of Rules, named a finalist for the Washington State Book Award. With Theresa Warburton, she is co-editor of the anthology Shapes of Native Nonfiction, forthcoming from University of Washington Press. She has received fellowships and awards from the National Endowment for the Arts, Artist Trust, 4Culture, Potlatch Fund, and Hugo House. Elissa is an assistant professor of English at the Ohio State University. Sondra Segundo is an artist and singer of the Haida language. She is an educator and has worked with youth in schools and programs throughout the Northwest, teaching art and sharing her Indigenous children’s books and songs. Everything Sondra does tells a story. Her composed Haida songs tell a story. Her illustrations in her books tell a story. Her movements while she dances, tell a story. Although she is individually accomplished in each of these facets of her life, they are all intertwined by her passion—storytelling. Recently, Sondra has been recruited by tribal-funk band Khu.eex’ as lead female vocalist and has performed at venues such as The Paramount Theater & Upstream Music Fest. She released her first personal music album “Díi Gudangáay uu Síigaay-I Can Feel the Ocean” on 8-8-18.